Brief Description of Subject: Jesus kneels in prayer beside a rock. Peter, James, and John sleep in the foreground. 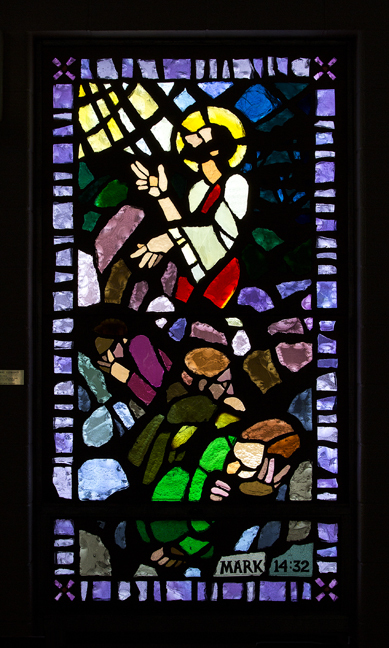 This window, depicting the experience of Jesus praying in the Garden of Gethsemane before his betrayal, was donated by Esther, Patty, and Jerry Marshall in memory of Esther’s parents, Aaron and Mary Avery, and husband, Marion, and was installed May 28, 1976, and dedicated June 6, 1976. It shows Jesus kneeling in prayer beside a rock. In the foreground Peter, James, and John are sleeping while Jesus anguishes in prayer over the events soon to befall him. Light from Heaven streams down and touches his face as he prays, “If it is possible, let his cup pass from me. Yet not my will but thine be done.” The synoptic Gospels (Matthew, Mark and Luke) tell us that after the Last Supper, Jesus and the disciples (except for Judas Iscariot) went out to the Mount of Olives. Gethsemane means “olive press” and so it is likely that the Garden was on or near the Mount of Olives (also known as Mount Olivet). There, Jesus left eight of the disciples and took with him the three who formed the inner circle: Peter, James, and John, and went further into the garden. He asked them to remain awake and wait with, and went a little farther into the garden to pray. Three times he came back and found them asleep. “Could you not watch with me one hour? The spirit is willing but the flesh is weak.” The third time he awakened them and said, “My betrayer is at hand.” The soldiers led by Judas Iscariot arrived to arrest Jesus. The artist has chosen deep colors for this window, emphasizing the seriousness and the import of the event. It was in this experience of prayer in the Garden that Jesus finally and totally committed himself to see through to completion the events to come: his arrest, trials, and crucifixion. Many theologians have argued that it was in the Garden that the battle for human salvation was won. After the prayer of Jesus: “Thy will and not mine be done,” all else was settled and inevitable. It was in this prayer that Jesus found strength to face the coming trials and torture, knowing that despite all appearances, God was in control. Artists Richard Hanley and Mark Taleba. Installation by Omnibus Studios, Okemos, MI.